Very beautiful painting and very well made! It’s just simply beautiful! Abstract Rose Rouge' feels like a new take on a classic piece. The inside of the rose seems to never end. The detail in each petal and every wrinkle is so precise and special your guests will be captivated by its beauty. The allure of a dozen roses is captured in this elegant piece, and you don't have to water it. 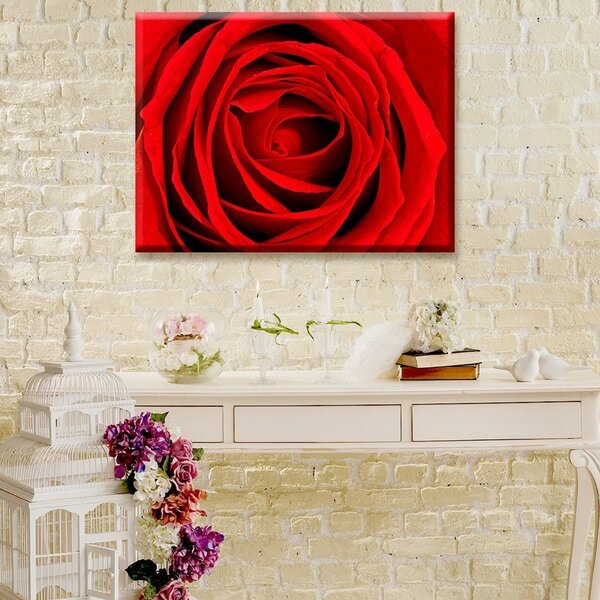 'Abstract Rose Rouge' comes on Gallery Wrapped canvas with easy, Ready2HangArt instructions. This lovely piece of wall decor will rejuvenate your living area. Made in the USA from US and imported parts. Please note:Options of excessive weight or bulk will be shipped via Freight carrier and our Oversized Item Delivery/Return policy will apply. Please click here for more information. 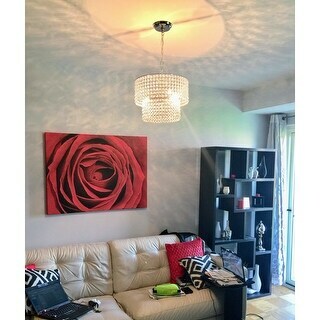 in love with this piece , I can't get enough of the red roses . This is my second version of this print, bought a great red comforter and red rug from overstock to match . This is one of my favorite pieces I have! 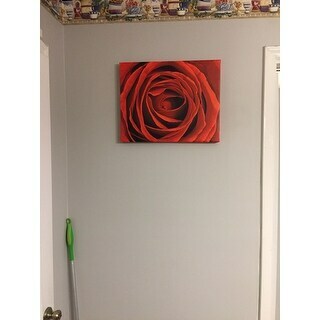 I have paired it with black and white canvas from overstock as well and they compliment each other so well! We recently moved into our home and immediately searched on Overstock for our decor needs. Then we stumbled across this and couldn't resist. Looks like the real thing. Goes well in our sitting room. Amazingly beautiful. I love this Art. I had another on before but went missing when I moved! I had to have another. It is simply gorgeous. Great buy. Had a few spots on it that looked like the color had faded but the picture was prettier in person than on the website. May have been just a defective item. Beware, this picture smells like mold and mildew. Just awful. This is the most beautiful canvas art i have seen in person. Looks just like the picture but even better. I have it hanging over my bed my in the master bedroom. The colors are so bright and rich. I absolutely love it! "what is the difference between canvas art and 'wrapped' canvas art?" Canvas Art and Wrapped Canvas relatively mean a similar thing which is that it is art on canvas. The statement Wrapped Canvas just verifies that the art (canvas) is wrapped (or stretched) around a wood frame.